This is an old picture of my Mom, Dad, Brother Jamie and Me when I was about 5or 6 years old. Daddy was just getting ready to fly to Colorado for a hunting trip. I believe he was going with Jim Menzies, or Buddy Speck who likely took the picture. I can't really remember this picture, but I'm sure I was wishing I was going with him! After all, Flying is fun! This weekend I met a lot of airplane people! I will share more of that this week. Fly 50! Well, I’m on my way home. My travel started yesterday the 17th in Afghanistan with a 2 hour flight to Dubai, UAE. After enjoying the airport in Dubai for 11 hours I boarded a plane to Dulles, VA. I slept like a rock for a good portion of that 14 hour ride. My seat was on one side of the center section with five seats in the row. There were only two of us in that section so the only question was which one of us was going to get to lie out over the remaining empty seats. Not wanting to seem un-gentlemanly, I deferred to the lady at the other end. Her name was Victoria T. I’m sure she had a last name, but she didn’t give it and I didn’t ask. She was a very friendly young lady and before the flight attendants had served our meal she and I had already struck up a conversation. She asked me where I was from because she said she could hear a “southern” accent. Of course, being the Texan that I am I was glad that she asked. I hate to ask people where they are from because as the Texas wisdom goes- “If they are from Texas they will tell you soon enough, and if they aren’t, you don’t want to embarrass them”. Since she asked first, and I could definitely hear an accent that was decidedly NOT from the southern United States, I decided to take the bait and ask her to reciprocate. Turns out she was from Nigeria. Although, she had been born in Alabama, she moved to Nigeria when she was young and lived there until she went to college in, of all places, Alabama. A Pharmacist by profession, she had been to Dubai on vacation where she met with her brother and sister. Of course, I told her about my Fifty 50 plans and she was very supportive. I gave her the website address and she gave me her email address to keep her updated. On the flight from Dulles to Houston I sat next to Alex. His first words to me were to express his discontent with being in the middle seat of three. Nobody likes the sardine seat as he called it. Actually, after he explained that his mileage points had been affected by the merger between Continental and United Airlines, I understood his disappointment. He normally gets to pick his seat assignment, but today, he wasn’t able to. Turns out we had a great conversation. Alex was from Utah. Yes, he is a Mormon, but no, he doesn’t have multiple wives. He has 4 children, but spends lots of time on the road…airlines… and is gone most of each week for business. Like many of us he is good at what he does, but what he does keeps him from what he loves: his family. His flight today, like mine, was taking him home. I shared my Fifty 50 plans with him and like everyone I have discussed it with he was very supportive. I AM going to fly 50 planes in one day, and I am going to raise at least 50 thousand dollars for charity. Life is good! Now I’m in Houston, Texas. I’ve had a 4 hour layover to catch a one hour flight to Killeen so my lovely bride, Juli, can meet me at the airport and drive me the 20 minutes to get home. From here I could drive to my house in only 4 and a half hours, but then I wouldn’t have had the time to write this and talk to Juli, my brother Jamie, and several others on the phone. Now, I am finally about to board my flight to Killeen where Juli will be waiting for me. I am so ready to see her and I know she is ready to see me. Boarding call! It’s time to shut this down and get in line. Sea Bee Sarah- Our young men and women making us proud! Well, my time here in Afghanistan is drawing to a close…at least for this tour. It is however, with a tinge of sadness that I prepare to leave. Even though I don’t like being away from home, I do like that I am able to contribute to the cause. Of course, I’m “only a contractor” now and not a Soldier, but it is an honor to be among our young men and women who are the warriors. Here on our base we have an area we call the “Boardwalk”. It’s basically the town square, and its main thoroughfare is a covered walkway made of boards. There’s a roof over the walkway made of wood that provides shade. This set up gives it an appearance similar to the old covered wooden bridges. The walkway is built around a large square of sand that encompasses a basketball court, a concrete hockey rink, a stage and an area to play softball, cricket beach volley ball or other running around in the dirt type sports. The entire field is about the size of two football fields placed side by side. Around the outside of the boardwalk are some local vendors as well as some “from home” type establishments like KFC. Being a NATO base there are soldiers, sailors and airmen/airwomen from several countries and branches of service stationed here. Many of them stop by the boardwalk at all times of the day and night for coffee, pizza, souvenirs internet wifi, etc. The other day as I was sitting at a picnic type table with Jared, one of my fellow contractors, a couple of Navy Sea Bees sat down across the table from us. One was a young lady and the other a slightly older young man, each wore a shoulder holster with a loaded 9mm pistol and carried a large slice of pizza. They were quite obviously enjoying just relaxing in the shade and shooting the breeze. I had my guitar with me and was kind of strumming, but mostly just talking with Jared about my 50 / 50 plans. She said yes, and proceeded to tell me more. I learned that both of them were in fact Navy SeaBees, which is the nick name for the Construction Battalion. Sea Beas typically build stuff! She was the same age as my oldest daughter and, by trade, a carpenter, he was a heavy equipment operator. Another young lady who showed up and sat with them was an electrician. On this tour though, instead of building they had been cross trained to run convoys of materials between the different Forward Operating Bases throughout southern Afghanistan. She asked if she could play my guitar and then proceeded to tell me a story of her first encounter with the Taliban. As she spoke I couldn’t help but think about how times have changed. We all know that Combat is no longer limited to young men, and all of our young people are experiencing events that will forever change who they are. Even though she spoke with a sense of humor, and a hint of nonchalance, I could tell that she knew it was no laughing matter. She and her shipmates are true Patriots! I am proud of our young men and women. Or click on the picture of the boardwalk. People always amaze me! This morning while I was standing in the line for an omelet at the Chow Hall, (in Afghanistan) I found myself standing next to a Navy Chief Petty Officer. A “Chief” is an E-7, which is the 7th step up the ladder as an enlisted Sailor. Advancement into the Chief Petty Officer grades is the most significant promotion within the enlisted naval ranks. He explained that the The Fleet Marine Force (FMF) insignia can be awarded to Navy personnel assigned to Fleet Marine Force command, a combined command of US Navy and Marine Corps. He had spent 12 years as a Navy Corpsman assigned to the Marines. Semper Fi! I had been a Marine and some of my best friends had been Navy Corpsmen. We chewed the fat about Jarheads and Squids of now and yesteryear and then my omelet was ready. 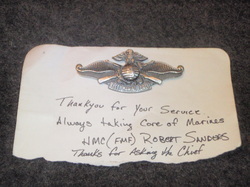 Thank you Robert Sanders for your service and for making my day! God Bless you! 2-2-2 to go! . . . . . . . . . . Click the title or here to comment! Today, like the date of my 50th birthday (12-12-12) is one of those dates that only come around once in a lifetime. 10-10-10. As of today I am 2 years 2 months and 2 days away from the big Fifty 50. I am making progress, and have been talking to lots of folks over here in Afghanistan about it. I’ve gotten a few on video to say a some kind words and will be posting some of that soon. Today is also my grandmother's birthday. It's the first since her passing and would have been her 99th. Yes, I did call my Mom. Mamarite was a major influence in my life! I miss her, but she lived a full and worthwile life all the way up to the end. I doubt she had many regrets and I will not mourn her moving on, she was ready to go. I will always be a better man for having had her in my life. I also did a little a little guitar picking with some of my young Navy friends. My friend Kieth video taped that too, so I may post some of it as well…I’ll have to see about that though. Anyway, this is just a quick update as it’s time for bed and I wanted to make a post on 10-10-10. Only one week left in Afghanistan: at least for this trip. God Bless. You know, as I mature, I see need all around me. As I count my blessings daily, I don’t have to look far to see many who are less fortunate than I. Many of those, unfortunately, seem to always be “down on their luck” and have someone else to blame for their misfortune. I am not interested in donating money, time, or effort to them. Cruel?…maybe, but true. There are those however, that through no fault of their own have been dealt a less than stellar hand. Diabetes is one of those diseases that no one chooses, yet if diagnosed, one must make many choices most of us will never face. Contrary to some popular belief Diabetes isn’t “caused” by eating too much sugar. Several members of my family, including my daughter, have been diagnosed with type 1 Diabetes. This is commonly called Juvenile onset Diabetes because it is usually diagnosed early in life. Type 1 Diabetes isn’t brought on by being overweight or poor lifestyle choices. In my daughters case she was only eight years old when we discovered that she would have to take insulin shots and manually regulate her blood sugar levels for the rest of her life. Because of extensive research Diabetes isn’t the “death sentence” it once was, but it can still be very debilitating and much more research is needed. The long term effects of living with diabetes, even with the best care available, today often leads to loss of vision, amputation of limbs and early failure of internal organs. Research costs money. That is why I am considering dedicating this 50/50 event, my birthday celebration, to raising money for Diabetes. Although it isn’t an Aviation Related Charity, it is related to me through my family members. Today marks the 9th anniversary of the ruthless attack on our nation and it's way of life. 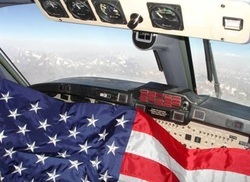 On this day, I was afforded to opportunity to carry several United States Flags aboard the airplane I was flying over the country of Afghanistan. Although these flags belonged to soldiers, family members and friends, having them aboard served as a reminder of the resolve we Americans have to preserve our Freedoms. Just as not every American is good (look at the prison rosters), neither is every Afghani bad! I assure you that the coalition forces are going to great lengths to assure that we get the bad ones (TALIBAN), and protect the innocent. Today, as everyday, we remain committed to the mission. In that respect, it has been a great day! Sometimes it's good ...even for an aviator...to be grounded! 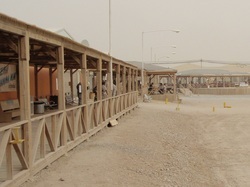 It's been windy and dusty here in Afghanistan! It's been so dusty in fact that most airplanes have been grounded. That being the case, I took some time to do a little tweeking on the website. Although I keep telling everybody that this is just a "proof of concept" site I am spending quite a bit of time working on it. Of course, the slow internet connection speed here turns every minute into ten....but that's another story. So far I'm still getting postive feedback from everybody about the concept and idea. One family member was good to remind me to "do for others". It's great to have a family that keeps me grounded...not in the way that low visibility keeps a pilot from flying, but in the sense of being in touch with who I am and what is really important in life. As I have professed all along, I intend to use this event as a means to promote aviation etc, and raise money and support for a charity. Preferably an aviation related charity. I haven't mentioned a lot about that yet, because I am still trying to figure out how to actually do it. I want to do it right you know! Well, it's been a few days since I posted anything, but I doubt anyone has noticed.... I'm still doing a lot of "thinking" about how to actually go about this. I've been keeping busy at work and trying to stay cool in the wonderland of sand in Afghanistan. My internet connection has been unreliable lately, and updating the website is very difficult at times, However, I've been doing a little more "pickin' and grinnin' with my guitar. I think most of my coworkers are wishing I'd get back to working on the website.... At any rate, for those who are following this; thanks! We still have time..... You know, I think I need to put a countdown calendar on here. Now I've got to figure out how to do that.. By the way, I'm still waiting for my first comment on a blog entry. By now, you know who I am and that I'm possibly out of my mind. If you want more proof read some of these postings.